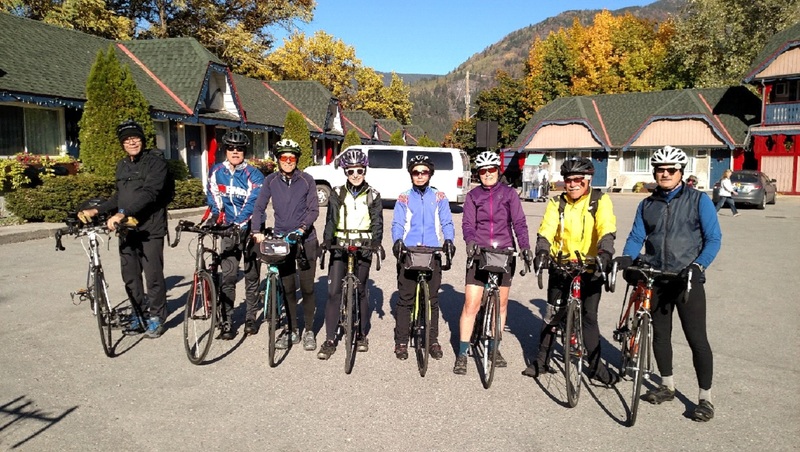 A group of 12 Spokane Bicycle members took a 4 day loop tour starting in Nelson, BC from October 2nd thru October 6. The members of the group included: Scott Schell, Amina and Barry Giles, Dud Bowers, Mary Rosner, Mike Darrah, Gloria Castellow, Lila Meglio, Jeff MacLennan, Katie Jones, Barbara and John Beaton. 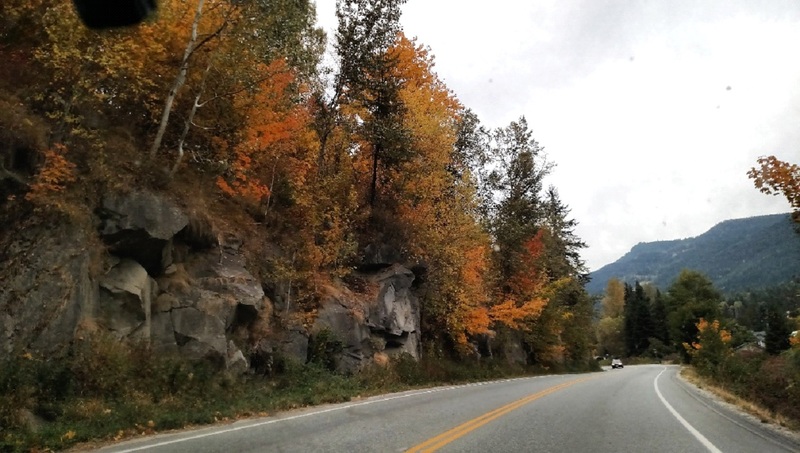 The purpose of the trip was to take a leisurely ride through beautiful country and enjoy the autumn colors. Some of you in the club have done this ride in the past – it is 140 mile loop called the PAGE (Pedal Around the Glacier -Eh) ride and is done in two days rather than 4. We had a sag car that carried our luggage (and some riders at times) to the 3 stops that we made on our way. We stayed at hotels, Air BnBs and cottages at the three different stops. Thanks to Scott, John, Barry and Mike who took turns driving the sag car – very much appreciated! Day 1 – Travel day to destination start. We caravanned to Nelson and stayed at the Alpine Inn. We took advantage of a swim and dinner at the Ainsworth Hot Springs. It served us well to get all loosened up and ready for the tour. Day 3 - A little chilly and windy in the morning as we walked to the same restaurant for breakfast. We then took off for New Denver (32 miles). A very steep hill going out of town and then it looked as though we were going downhill or flat for a long way – only we couldn’t figure out why we were pedaling in low gear or at all if we were going downhill?? We decided it was a strange optical illusion. This was a gorgeous stretch with very little traffic and the final long downhill into New Denver was newly paved and WOW what a great ride that was!!! We all stayed in the same hotel and ate at the same restaurant (only game in town) and took a little hike along Lake Slocan. Day 4 – Another beautiful day as we took off for Winlaw (32 Miles). We hit a long hill (6 miles) that seemed to get quite steep as we went along – it was a great feeling of accomplishment to get up it and enjoy the view of Lake Slocan from such a great height. The ride down was wonderful and a great reward for sloughing up that hill. We stayed at the Karibu Lodge in Winlaw. The cabins were comfortable and rustic – which was good as it was the only place that was halfway between New Denver and Nelson. Had a leisurely walk along the river and ate at a bustling little Mexican restaurant. colder – sometimes we felt that we were going to get blown off the road. Froggy’s was a very popular place especially with bicycling groups and served great breakfasts. And what a ride downhill on the way back – Whooee!!! We all made it safe and sound back to the Alpine Inn in Nelson. We said our goodbyes and headed back to Spokane. We were lucky to have had good weather and really enjoyed riding through the beautiful countryside and taking in the lakes, rivers and forest and of course the beginning of the fall colors. Kudos to those who rode the whole 140 miles: Amina, Lilah, Gloria, Katie, Dud and Jeff. All in all a great trip and lots of fun!